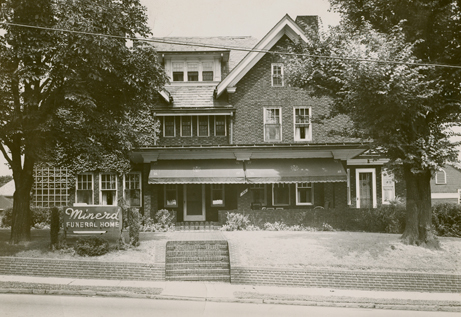 Perhaps the most visible landmark of our family's long-term presence in Fayette County, PA -- the epicenter region of our clan's growth and development the past 210 years -- has been the Minerd Funeral Home of Uniontown. Founded in 1921 by entrepreneur Edward Eugene Minerd, the facility has handled funerals for many hundreds of families during its lifetime of eight-plus decades. The first funeral home was located at the corner of East Church and Iowa Streets in Uniontown. Then, in 1949, Edward's widow Lida moved operations several blocks away to a more modern, spacious and air-conditioned building. Prominently located on West Main Street, the new site was much more visible to the public and had its own off-the-street parking lot. In 1978, the home was sold to James D. Barnett, who operated it for many years as the Barnett Funeral Home.